Legendary South Lake Tahoe snowboarder Shaun Palmer competes in the 2014 Tom Sims Retro Worldâs Snowboarding Championships at Soda Springs. 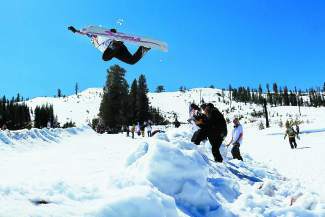 SODA SPRINGS — The 2014 Tom Sims Retro World’s Snowboarding Championships featured an impressive list of legendary snowboarders this past Saturday and Sunday at Soda Springs, where competitive freestyle snowboarding got its start back in 1983. The event — held in honor of the late Tom Sims — included giant slalom racing and an old-school snowboard halfpipe contest. All competitors rode vintage snowboards from early manufactures such as Avalanche, Barfoot, Burton, Sims and Winterstick. Everyone was there to have a good time with friends and family, ride the old boards and show respect to the sport that we all love and helped create. The giant slalom was a timed, best-of-two-runs event, with snowboard men’s legends, women’s legends and open classes. Kevin Delaney took first place among the men’s legends and was followed by Shaun Palmer in second, Chris Roach in third and Dennis Nazari in fourth. There were many racers worth mentioning, like Keith Kimmel, Monty Roach, Smokin’ Jay, Bob Klein and Barfoot. In the open men’s race, Cody Horan claimed first place, while Cameron Beck was second, Shawn Farmer was third and Mark Vitelli was fourth. Other racers like Eric Messier, Gray Thompson and Kyle Frankland gave them a run for their money. Only two riders competed in the women’s race, with first place going to Christie Elder and second place going to Laurie Asperas. Sunday featured the halfpipe, aka, the “Ditch of Death,” which was made by pushing snow up into two walls about 6 feet high, 25 feet apart and 150 feet long, then using hand shovels to make jumps along the way — just like we did it in the old days. This is where a lot of the action occurred. It was a jam-session format with three old-school snowboarders as judges. It turned into a “just go when you want” format. The lineup of tricks consisted of big tweaked frontside and backside airs, backflips, McTwists, Cab 360s, handplants, rock ‘n rolls, laybacks and lots of style. Everyone rode with smiling faces and enthusiasm. Truckee Olympian Danny Davis showed his respect to the sport by showing up and shredding the pipe with us, even taking a run on my old 1979 wooden Burton backyard model snowboard. Canadian Olympian Mark McMorris also took part. Chris Roach finished first among the men’s legends. Solomon Arthur took second and Delaney third, while Palmer, who finished fourth, duplicated one of his winning runs from one of the first World Championships he won at the beginning of his career — backside method, frontside 360, cab 360 rock, air to fakie. It was amazing to see so many good riders having so much fun ripping it up in this old-school halfpipe. Messier claimed the top spot in the open men’s class and was followed by Horan in second and Thompson in third. Elder and Asperas finished first and second among women, respectively, and Keenan Sutter represented as a junior rider. Overall winners also were awarded. Chris Roach earned the highest honor of the men’s legends, Delaney was second and Palmer third. Horan, Messier and Thompson were overall winners of the open class, and Elder and Sutter topped the women’s and junior fields. Other riders who got some shreddin’ in were Jason Basarich, Jason Loeb, Pauly Johansen, Cameron Beck, Silver Serino and Rick Shimpeno. Even Daron Rahlves, a three-time Olympic alpine ski racer, was on hand to check out the action. — Author Andy Berendsen, who originally made a name for himself as a pro skateboarder from Winchester Skate Park in San Jose, competed in various snowboard competitions in the Lake Tahoe area throughout the 1980s. He can be found these days shredding Sugar Bowl and the Truckee Skate Park.